As you might know, your Wohven's t-shirt subscription brings you excellently crafted items as comfortable as they are durable, meaning they will last literally figuratively forever. That being said, maybe you’re tired of wearing the same design, and it’s time to move one of our old shirts out of rotation. The good news is that even in this scenario, there are several different ways our premium t-shirts can serve a noble purpose in your life. Wear one of our blank t-shirts or graphic t-shirts while working out. Our tees are comfortable, and they are stylish, but in a subtle “I’m not trying too hard to look like a model while working out” sort of way. It’s the perfect middle ground. Depending on the status of your old graphic or blank t-shirt, it could still serve as a great undershirt for your denim jacket or plain button-up. Also sometimes it gets cold, and you just need double shirt warmth, so throw a Wohven tee on underneath that sweatshirt. Just because your graphic t-shirt isn’t decorating you, doesn’t mean it can’t decorate your life. Stretch our artist's designs over canvas, and arrange them in an aesthetically pleasing manner of your choosing. Instant art! Why should your regular car upkeep be boring? The next time you’re drying/waxing your car, just grab an old Wohven t-shirt for the final step, and let our shirt’s minimalist artistic genius transform this chore into a rumination on the beauty of simplicity in an increasingly complex world. Or whatever. Pass on the gift of Wohven to your best friend. Just cut an old tee into strips, braid them together, tie off the end, and then spends hours (and hours, and hours) playing tug-o-war with your dog. This also could theoretically work as a way to fend off wild animals, but for legal reasons we are not advising that. As we covered in point one, you are human regularly prone to to high amounts of physical exertion, which means you’re familiar with sweat stinging your eyes. The solution lies in your Wohven tee, which can easily be turned into a headband. Maybe you’re thinking, “I can’t wear a headband, as that would look ridiculous.” But you know who wore a headband? 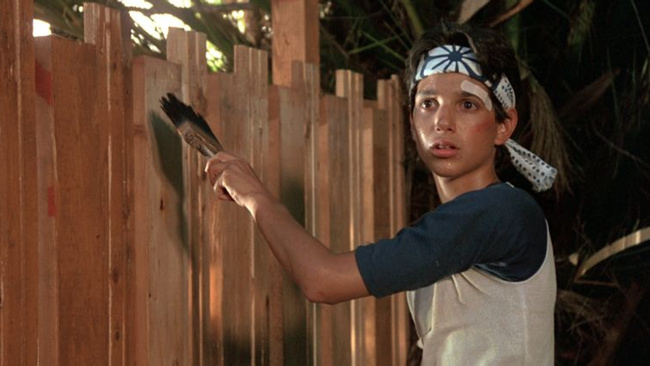 The Karate Kid. And he beat Cobra Kai. Think about it. The practical application of this is less clear, but imagine how cool one giant tee made up of a dozen normal Wohven tees would be? If you do this, please take a picture wearing it so we can show off how awesome you are on our Facebook, Instagram, Twitter .....everywhere. The point is there are a lot of uses for your t-shirt subscription, even when a tee's best days are in the past. So keep giving it some love, and may the Wohven tees be with you, always. Have other ideas for how to reuse old t-shirts? We would love to hear them! Leave a comment below! This idea is where I thought Idea 7 was going. I think it would be cool to turn the shirts into a quilt. Maybe each design could be a single square panel. This would require having a lot of shirts, but I’m okay with that.